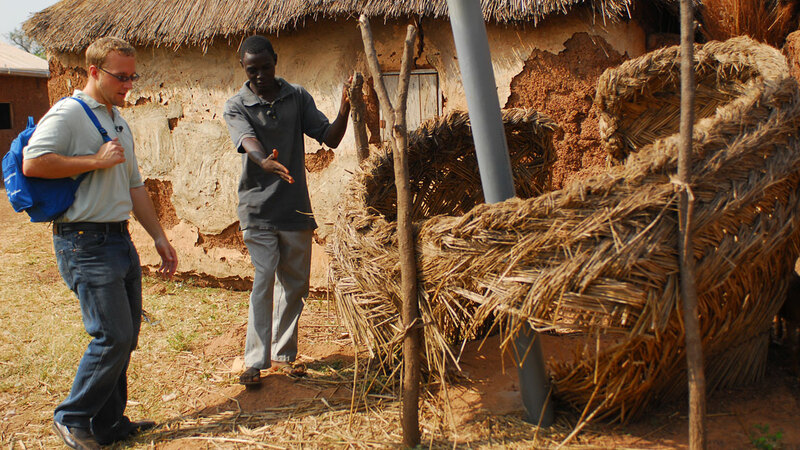 To improve environmental hygiene, the program partnered with Tingoli residents to build latrines for each household. Latrines help reduce fly populations by discouraging open defecation practices, which offer breeding grounds for flies. 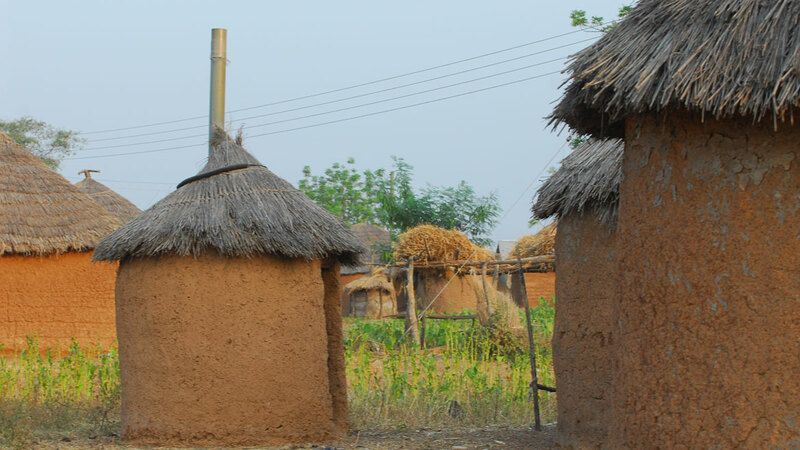 Nationwide, more 7,500 latrines were built over seven years. 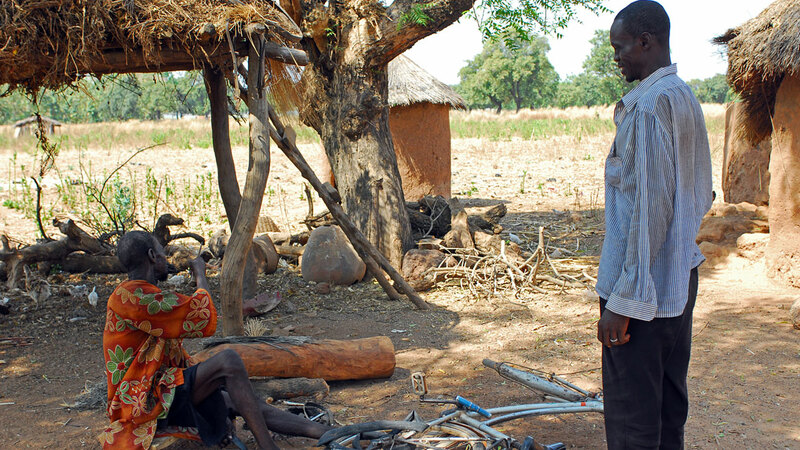 In the nearby village of Ngylo, bicycle repairman Abada Aziz (left) points to his family's latrine. "When The Carter Center approached us about building latrines, I was hesitant," said Aziz. "There were many other things we needed. But now the benefits are clear. I no longer struggle to walk to the bush to go to the bathroom. My family is healthier. It is a big improvement." Ghana’s extreme weather conditions, from brutal droughts to month-long rains, can destroy or damage latrines as well as homes. 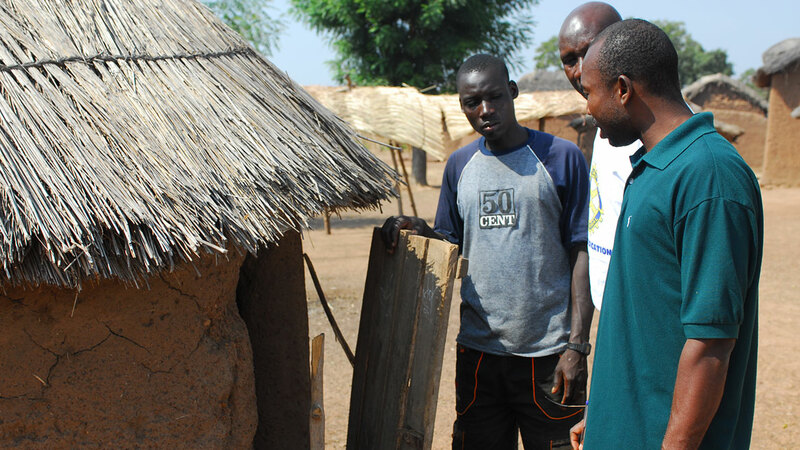 Here, Carter Center technical assistants examine a latrine damaged by rains. The superstructure of a latrine can be rebuilt, and the latrine is still useful as long as the cement slab remains intact. The Center trains a core group of masons, who in turn train others in their communities. 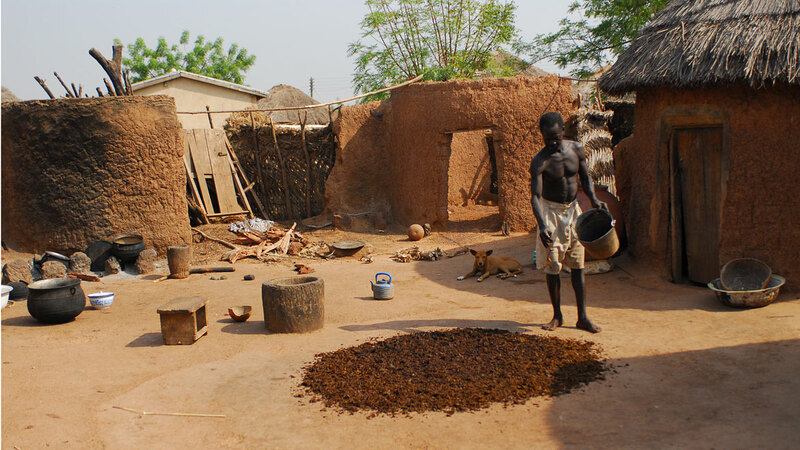 Families are responsible for maintaining their latrine. Carter Center trachoma technical assistant Yussif Yakubu (right) visits villages to encourage residents to maintain their latrines and wash their hands and faces to prevent spreading bacteria. 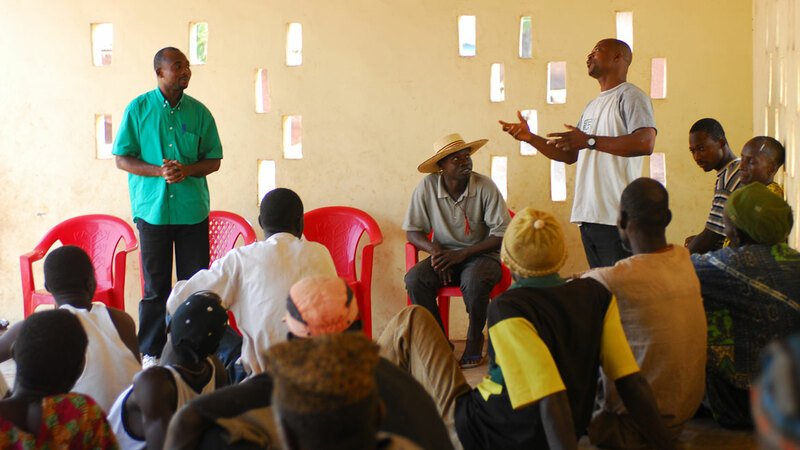 The Ghana Health Services-Carter Center partnership trained more than 8,000 community health workers—teachers, official health officers, and village volunteers—to deliver core disease prevention messages to villages. Ongoing health education is critical. Although the most severe form of trachoma — trichiasis or blinding trachoma — has been eliminated, Yakubu still leads education workshops daily. Here, he answers questions about environmental hygiene for residents of Zoggu. Community members voice concerns and share successes at the sessions. 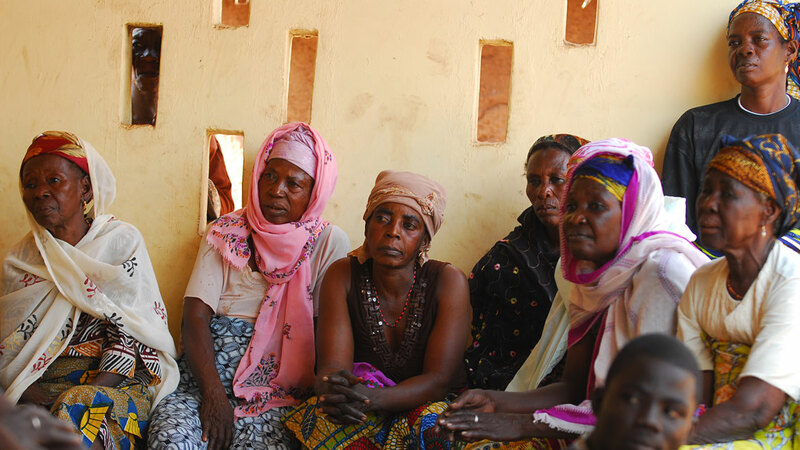 In Zoggu, many women attend the workshops on behalf of their husbands, who are busy harvesting crops from their fields. If the village is very large, drama groups may be organized to present trachoma prevention techniques in an entertaining way to both children and adults. Radio broadcasts of simple and captivating trachoma prevention jingles in local languages also are effective in reaching remote villages. 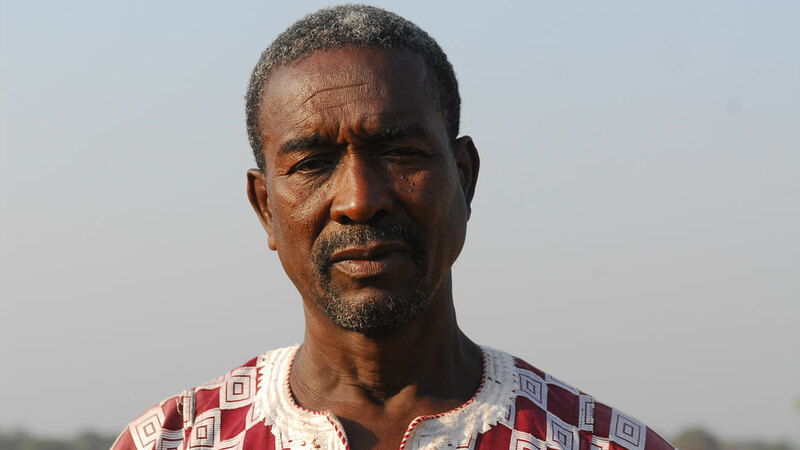 Alhassan Fuseinni, who suffered from trichiasis, endured eye pain, poor vision, and sensitivity to light. His grown children had to support him for years because his eye condition prevented him from working as a driver. Program staff convinced him to seek surgery at a local eye clinic, and he now enjoys more independence and autonomy in his daily life. 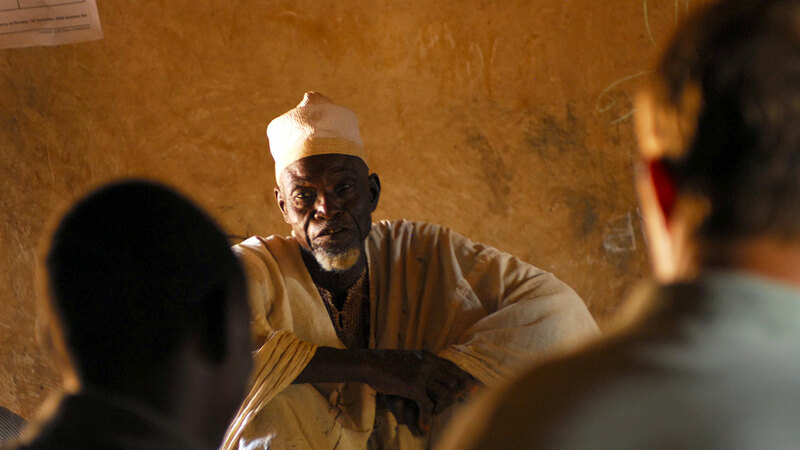 Since community members heed the advice and counsel of respected leaders, the cooperation of village chiefs is vital to fighting the spread of trachoma. Here the chief of Tingoli village talks with Carter Center technical assistants about the program’s success. A tobacco farmer in Tingoli spreads his crop around the dusty ground outside his family’s mud home to dry. 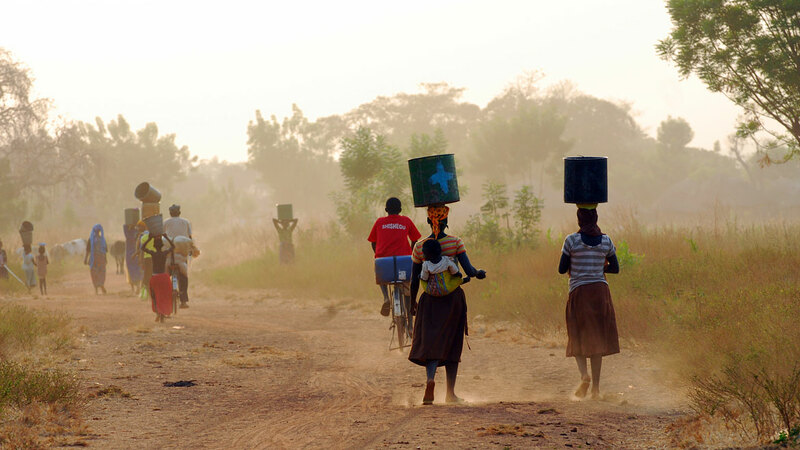 Most residents of rural northern Ghana are subsistence farmers, growing enough to live on or trade. Improvements in public health and health education reduce the risk of trachoma infection and lead to increases in the standard of living. In Ghana, the average annual income is about USD$520, but can be far lower in Tingoli and other villages in less-developed northern Ghana. 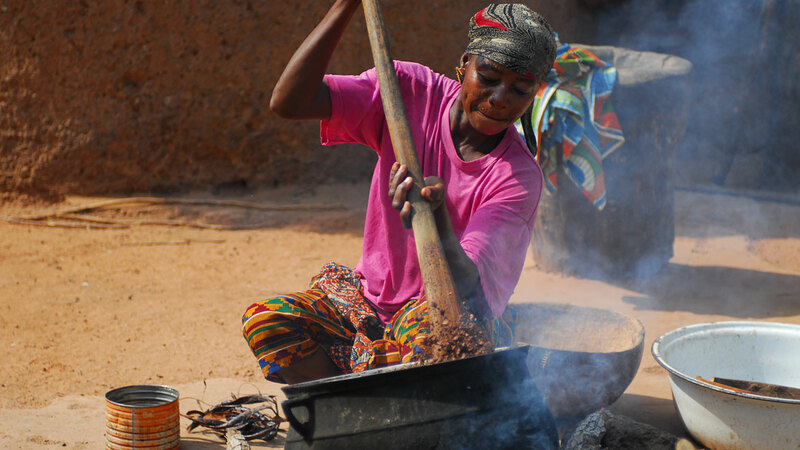 A woman cooks for her family in Tingoli. A trachoma sufferer would likely find it very difficult to complete such a task as the eyes are sensitive to smoke. This woman’s family has maintained their latrine for three years and plan to always do so, she said laughingly. Latrines keep families healthier and save them time, as they no longer have to trek to the bush to use the bathroom. 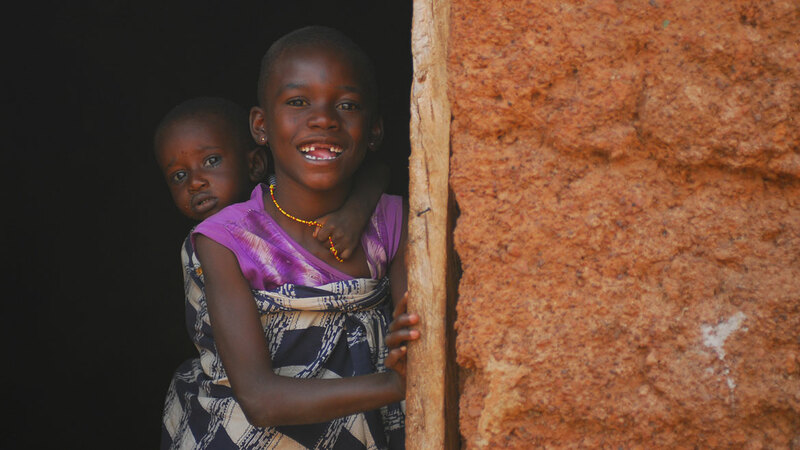 When a parent has trachoma, children bear a strong burden in the household. Now that Ghana is nearly trachoma free, soon children will no longer be seen caring for their elder relatives who suffer from trichiasis. Lessons learned from Ghana’s success at eliminating blinding trachoma are being applied in other African nations. The Center also supports trachoma control in Ethiopia, Mali, Niger, Nigeria, and Southern Sudan in conjunction with ministries of health, Lions Clubs, the Conrad N. Hilton Foundation, and Pfizer Inc., which donates the antibiotic Zithromax®.